At Evendine House we offer a variety of accommodation facilities to suit all needs and requirements. All of our rooms have been purposefully designed and decorated to provide a cosy, relaxing, and homely environment. Our rooms are fully equipped and many also have their own en-suite bathroom. Residents are able to personalise their rooms to suit their own tastes. We are also a pet friendly home and allow our resident’s pets to stay with them at Evendine House. Along with all rooms being specially chosen to suit each resident’s needs and requirements, we also encourage our residents to personalise their rooms. 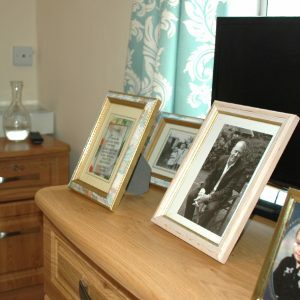 Residents are able to bring photographs, decorations and small pieces of furniture to help them feel relaxed and at home. Whilst our excellent care team are always available to help, we also encourage the involvement of our residents’ families and friends.